I start back to school in 2 days. The drought is making the leaves turn brown and fall to the ground so it looks a little bit like fall today. I'm already thinking about lessons for the fall semester and you might be, too! 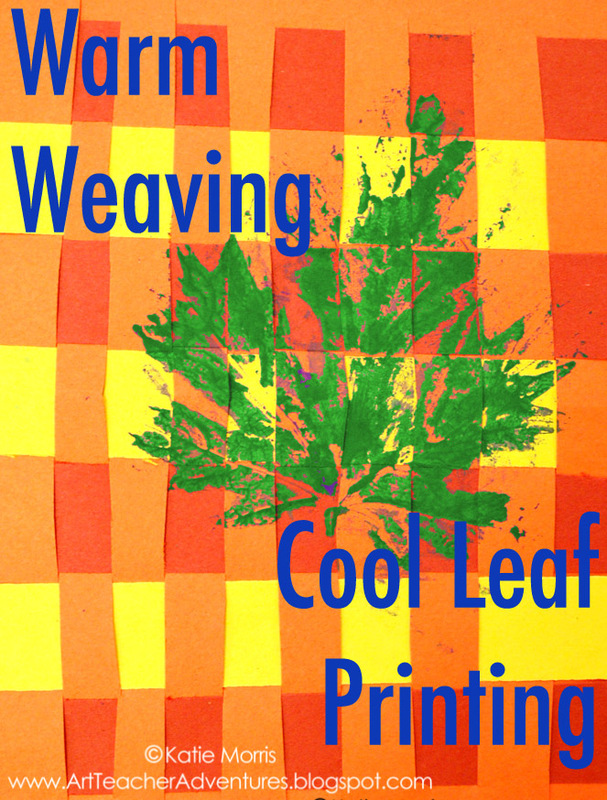 Back in my very first year of teaching (3 whole years ago seems like a long time now) I had planned a very similar lesson for 2nd grade but it took so long to weave, and I had a disastrous experience trying to print leaves with another grade, that it just stayed a weaving. I decided to be brave and try it with 3rd grade last year. 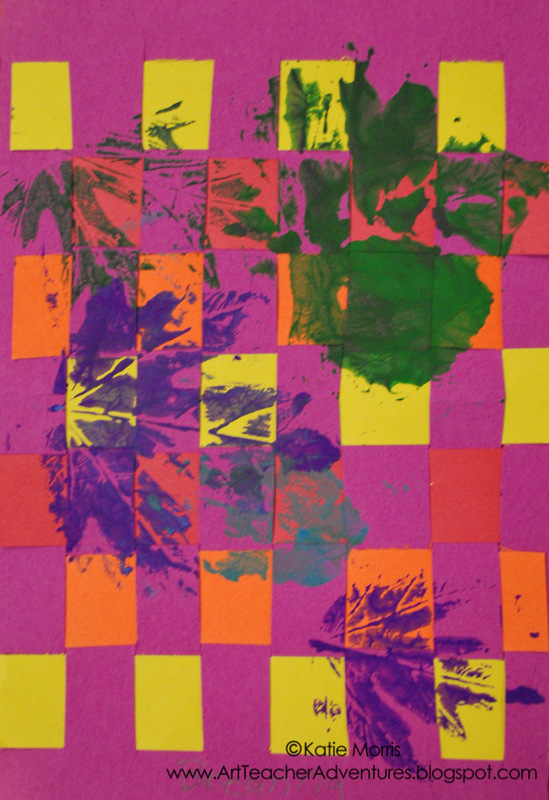 We reviewed warm and cool colors (I tend to incorporate a lot of color theory) and the students identified warm colors as "fall colors". 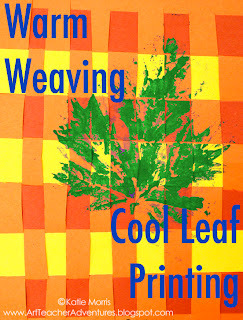 I explained that the students would be weaving using warm colored construction paper then printing leaves on top using cool colors. All except for a couple new students had learned to weave in Art class the year before so they didn't need much review aside from how to hold the folded paper to cut the warp and I had my early finishers help students who were struggling. I'm pretty sure we did this in one class period since I let the students choose from 6x9 inch construction paper instead of a full 9x12 inch sheet. After the strips were woven as tightly as we could get them, students with extra time added glue to the loose ends for extra security. After the weaving was complete, I passed out trays to each table with green, blue, and purple tempera paint and 2 brushes for each color. We didn't want to make a mess on the tables, so I passed out some odd sized paper scraps for the students to brush on top of. It didn't take long for us to realize that the negative space of the leaf had possibility so we reviewed positive and negative space and turned this into a 2 part project! 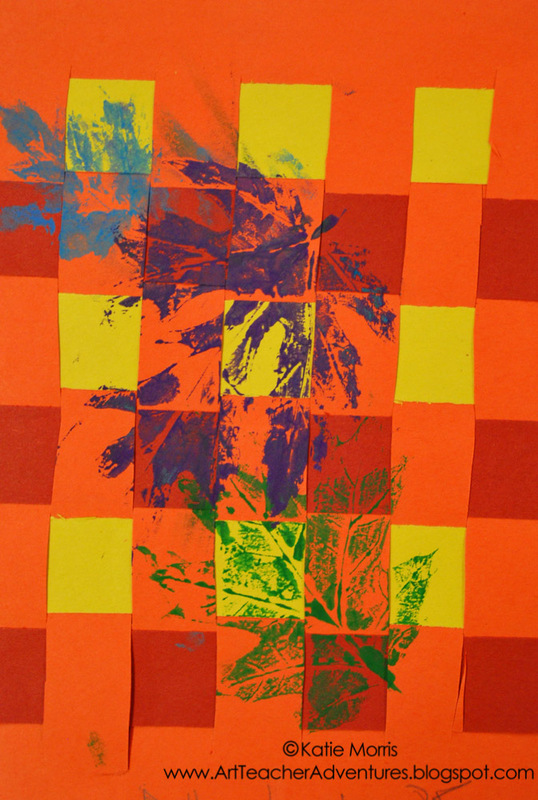 The students tried to make a nice composition with their overlapping negative space leaves as well as printing on their weavings. Happy Back to School! I have one more week off. 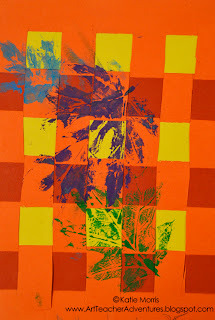 This is a wonderful idea and one I will give a try as I like to do a lot of color theory as well. My first year, we did a leaf collection and found out a few students got poison sumac! Now who lets that grow along a school fence line anyway?! We finished May 25th, you were probably teaching well into June! I live 40 miles away from my schools and have a 20 month old son so I never make it into school in the summer. We have 2 work days, this Friday and next Monday so those will be my "put the rooms together" days. I'm not going to plan much past the first project for each grade since I have a student teacher this year and I'm not sure when she'll need to start taking over.